Convenient to area attractions. Perfect for Large Families or Groups. Grill Out and Enjoy the Deck. This Cabin is Roomy Enough to Find a Quiet Spot for Yourself and a Good Book or Play Family Games by the Fire. 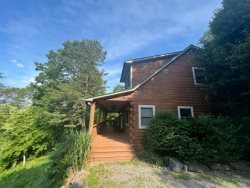 Enjoy the seclusion and warmth of this Smoky Mountain cabin, but still be only six miles from the grocery stores and downtown Bryson City. This peaceful setting on four acres of a wooded hillside overlooks the mountaintops in the Smoky Mountain area of Western North Carolina. 3 Bedrooms & 3 Baths: The upstairs first bedroom has a king-size bed, balcony and private full bath with shower stall. The main floor bedroom has a full-size bed and a full bath across the hall tub and shower combination. In the open loft area, there is a trundle bed of two twins that can be converted into a king-size bed. The ground floor has a large room with a TV; it has one set of bunk beds, and a trundle bed of two twins which can be converted into a king-size bed. There is a full bath on the ground floor with a shower stall. Bird watch from the front porch rocking chairs or your choice of upper or lower porch swings. Hummingbirds stop by the feeders, and other woodland creatures amble through the woods like wild turkey, doves, squirrels, and an occasional deer. Inside the cabin, you will enjoy sitting by the wood burning fireplace before enjoying a meal cooked in the fully equipped kitchen or on one of the two outside gas grills. You have your choice of dining inside at a big oak table or outside on the deck. After dinner, you can take a nice stroll on the mountain roads with one of the walking sticks the owner has thoughtfully provided. When you return to the cabin after your walk, gather your family for an old fashioned marshmallow or hot dog roast at the large fire pit. Back in the cabin, relax in the new hot tub or watch a good movie. Thank you for sharing your cabin with our family. We had a wonderful stay. Your cabin was like a home away from home. Love you have it decorated. The hot tub was just what we needed to relax at the end of the day. The screened in porch was perfect for morning devotions and for watching the humming birds and squirrels. We truly had a relaxing time. We can't wait to come back. Thank you again. This cabin in the woods was everything we had hoped it would be. It was exactly as it was described. We had a family vacation, that needed lots of room for 3 families. We each had a bedroom and bath, one on each floor. We loved the view, the hot tub, and especially the front porch. Everything we needed was provided, with groceries close by. We would highly recommend this house and this rental company to anyone thinking about staying in the Smokey mountains. We will Definitely be staying here again. Thank you for a wonderful week for our family. We had a great time and it was nice for everyone to be together. Thank you for a wonderful week for our family. We had a great time and it was nice an comfortable and perfect for everyone to be together. The staff was helpful and friendly. We had a fabulous time! The cabin was clean and cozy and was perfect for our stay. We live in Florida and wanted some winter weather and we got it. We had a perfectly beautiful snow while we were there! While looking for a property which would accommodate our group, GSCR was most knowledgeable about their cabins and helpful in assisting us with our needs. Were very pleased with the property itself and the close proximity to Bryson City. My entire family was very pleased with our stay in this cabin. It was the perfect get away in the most beautiful location. We roasted our smores, went zip lining, took nature walks, went mountain bike riding and had home cooked meals 3 times a day. We went to Bryson City and walked the shops, had the best ice cream and bought the baby a pair of John Deer boots. I sat on the porch and watched hummingbirds and listened to the children play. We went tubing on the lake also. We had the pleasure of seeing beautiful deer and white tailed bunnies .I cant wait to return to breath this mountain air and enjoy my family vacation like I never have before. My entire family was very pleased with our stay in this cabin.It was the perfect get away in the most beautiful location.We roasted our smores,went zip lining,took nature walks, went mountain bike riding and had home cooked meals 3 times a day.We went to Bryson City and walked the shops,had the best ice cream and bought the baby a pair of John Deer boots.I sat on the porch and watched hummingbirds and listened to the children play.We went tubing on the lake also.We had the pleasure of seeing beautiful deer and white tailed bunnies .I cant wait to return to breath this mountain air and enjoy my family vacation like I never have before. We loved the fact that the kitchen was well equipped, bathrooms and hot tub were very clean. It would be wonderful to have the road to the cabin paved. We found it somewhat difficult to get to the cabin due to gravel. This was by far one of the best cabins that we have stayed at. Cabin was well stocked from match sticks to extra blankets. I want to go back! I spent 4 days at Whispering Wood Cabin last week with some friends from high school. We hadn't seen each other in many years and it was an absolutely amazing weekend! This place is so calm and peaceful. The area is beautiful and the cabin was so warm and inviting, we loved it! I especially loved the deck with the hot tub and porch swings. It even had Wi-Fi. We enjoyed a fire in the fire pit one night (sorry for the noise down-the-hill neighbor!). The kitchen had everything we could have asked for, including instant hot water. The rooms are spacious and lovely. The birds chirped all day. Even the almost constant rain couldn't dampen our time there. I recommend this cabin to anyone wanting a great get-a-way. I know I can't wait to go back again! - Manager Response - May 16, 2013: Thanks so much for taking the time to review Whispering Woods Cabin. We're so glad that you enjoyed your stay. We hope you get to come back soon! When I first got here my eyes were flattered by the most beautiful and amazing cabin. What I liked was the steaming hot tub. Seeing the fireplace, and the upstairs and downstairs. This cabin really put our family together. We annually take a vacation around Easter every year. This was the first time staying in a cabin. What a beautiful home. We have enjoyed the cool nights and beautiful days. It has been so serene. Thank you for allowing us to enjoy this vacation in your home.